Domenica Corsi (nicknamed "Core-Breach") was the daughter of Aldo and Ulrika Corsi, born circa 2340. She had one brother, Roberto. The Corsis were descendants of a New York City firefighter who perished in the terrorist attacks of 2001. That ancestor's firefighter's axe became a cherished family heirloom, and Domenica Corsi's most valued possession. In 2355, Aldo Corsi and his brother, Giancarlo, were approached by Lieutenant Commander William Ross of Starfleet Intelligence to use their civilian freighter, Ulrika's Hope, to gather intelligence during their passage near the Cardassian border. Unfortunately, the Cardassians detected their covert activities, boarded the ship, and killed Giancarlo. This incident created in Aldo an intense dislike and distrust of Starfleet, and when his daughter decided to join, it caused a rift between them lasting many years. As a small child, Corsi would listen to her grandfather, who she called Nonno, tell stories around a campfire. Her grandfather died when Corsi was five, after she had discovered him collapsed and semi-conscious on the floor of their home. As of 2355, Corsi and her family lived on planet Madellin Prime. The Corsi family also lived on planet Galor IV at some point during Domenica's childhood. Corsi was a competitive swimmer as a youth, and had won trophies for at least three swim meets. Domenica Corsi first considered joining Starfleet due to her uncle Giancarlo's infatuation with the organization. As a Starfleet Academy cadet, Corsi began a romantic relationship with fellow cadet Dar Ableen, a relationship that would last for eight years. Corsi's first assignment as an ensign was aboard the USS Soval, where she worked directly under deputy Security Chief Heinrich Waldheim. Corsi's first command of a security detail involved piloting a shuttlecraft into the volatile atmosphere of planet Svoboda II. When Waldheim was promoted to chief of security of the USS Roosevelt, he brought Corsi along as his deputy chief. In 2366, Lieutenant (j.g.) Corsi was assigned to assist civilian peace officers on Izar in investigating an apparent string of serial murders. Corsi and Dar had previously arranged to share shore leave on Izar, and Corsi spent much of her off-duty time with him in Garthtown on Izar. However, the investigator in charge, Officer Christine Vale, uncovered evidence that pointed to Ableen as the murderer. Discovered, Ableen targeted Vale as his next victim, and Corsi was forced to use deadly force to save Vale. While Vale considered Corsi a hero, and was inspired by her to join Starfleet herself, Corsi became angry with herself for the way the situation turned out. This self-loathing would impact the relationship between the two Starfleet officers for years to follow. 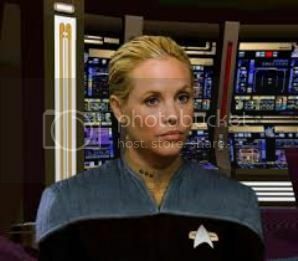 By 2374, Corsi had reached the rank of lieutenant commander, and was assigned as chief of security aboard the USS da Vinci under Captain David Gold. She became notorious with the da Vinci's crew as being a stickler for regulations and her fierce temper, which earned her the nickname "Core-Breach". In early 2376, on the tenth anniversary of Ableen's death, Corsi seduced fellow da Vinci crewmember Fabian Stevens in an effort to distract herself from her memories. Intended to be a one-time occurrence, a unique friendship developed between the two. Later that year, when the son of an Izar peace officer, Tomozuka Kim, joined the da Vinci security detail, Corsi is finally moved to open up to Stevens about the death of her former lover, enabling her to move past it and decide that she and Stevens are a proper couple. Corsi was promoted to full Commander in early 2377. As part of her promotion ceremony, her third solid rank pip was left outside the ship, with the intention of making her go outside in an EVA suit to retrieve it. Corsi instead had the ship's computer locate and beam it aboard.